Bejaia passenger and car ferry ticket prices, timetables, ticket reservations and information for ferries sailing from Bejaia to Marseille. Compare all available Bejaia ferry ticket prices in real time and book the cheapest available Bejaia car and passenger ferry tickets sailing to and from Bejaia, Marseille with Algérie Ferries or SNCM Ferry Line ferries online with instant confirmation. Book Bejaia Ferry Tickets with Algérie Ferries or SNCM Ferry Line for ferries sailing from Bejaia to Marseille online in advance to enjoy the cheapest available ferry ticket price. The price you see is the price you pay. There are no hidden extras or surprises such as added fuel surcharges or booking fees and we do not charge you anything extra for paying with a Visa Electron card. The price we quote you for your selected Bejaia passenger or car ferry ticket, onboard accommodation and vehicle type is all you will pay, and that's a promise. To obtain a Bejaia ferry ticket price and book your ferry ticket securely online please use the real time ferry booking form on the left. You are also able to add a hotel at your destination, or anywhere else, to your ferry ticket when completing your ferry ticket reservation. Bejaia is a city north-eastern Algeria situated at the Mediterranean Sea, by the river of Wadi Soummam, on the foot of Mount Gouraya. It also an administrative centre of Bejaia province. Bejaia is located far from other Algerian cities, but fortunately it has a good rail connections. There is also an airfield and a ferry between Bejaia and French Marseille. The city is very pretty. The main disadvantage is the air and water pollution. There is a fantastic Old Town, where you can see a mosque from the 16th century and a Spanish fortress ? also from the 16th century. If you miss clear water you can to Tichi, which is only 17 km from Bejeia. You can find there some beautiful and clean beaches. Bejaïa serves as a market town for an agricultural region of Kabylia, producing olives, figs, plums, oil and wine, in addition to wool and hides. Bejaia, Algeria is one place that you should not miss under any circumstances. Bejaia lies in the state of Algeria. It is well connected by all the major means of transport. The place is quite populated but you will really enjoy this very charming place. There is no dearth of tourist attractions in Bejaia. Trip to these fabulous places promises you a wonderful holiday. So come to the charming place of Bejaia, Algeria and simply enjoy. Following are some of the useful information about Bejaia. Bejaia is one of the most beautiful cities in the world. The location of the city on the shore of the sea makes it one of the most popular tourist destinations in the region. Set between the sea, a cape and a mountain, Bejaia is one of the most popular places among the travelers from all across the globe. The city bears the cultural heritage of Algeria. The narrow and meandering lanes of Bejaia in Algeria are truly intriguing. Though the streets are crowded most of the times, you will enjoy being amid all the people. According to the recent census, the population of the Bejaia, Algeria is less than 200,000 inhabitants. The city is one of the most exotic locales to spend your vacations. No matter whether it's a romantic getaway or a family holiday, your trip to the Bejaia will be equally enjoyable. Due to the French colonization, the culture of the city bears immense influence of France. The manifestation of such influence is perfectly evident in the various culinary delights served in the restaurants in Bejaia, Algeria. Not only the French delicacies, the various eateries in the city serve a number of local fares. With a wide assortment of fares, these restaurants are truly a haven for the gastronomes traveling to Bejaia. The main attractions in Bejaia comprise of the mosques and remnants from periods when military defense was an ultimate necessity. Set on the shores of the sea, this Algerian city bears close resemblance to any fishing village of the Mediterranean or any other place. The sandy beaches of the city are the other prime Bejaia attractions. Bejaia was founded by the Carthaginians long time before Christ. (the 1st millennium BC). In the 2nd century The Romans made it a commercial and military centre and named it Saldae. During the early Middle Ages it was conquered by the Vandals, but soon it became a town ruled by the Berbers. The Berber dynasty of the Hammadid family wanted Bejaia to be their capital city. In the 13th it was incorporated into the empire of Tunis, but only 200 years later it became a big and famous pirate stronghold. In the 15th centre the Spanish attacked the city and managed to take control over it, but couldnt relish their success for a long time, because in 1555 the Ottomans conquered the city and it remained a Turkish part of the empire for 300 years until the French came. At the beginning of the 20th century the port and the whole harbour were modernized and 46 years after that an oil pipeline turned Bejaia into one of the main Algerian ports and the most important port for oil transportation. Best Price Guarantee - We always offer you our lowest available Algérie Ferries or SNCM Ferry Line passenger and car ferries ticket price to and from Bejaia. There are no hidden extras or surprises such as added fuel surcharges or booking fees and we also we do not charge you anything extra for paying with a Visa Electron card. The price we quote for your selected Bejaia ferry ticket, onboard accommodation and vehicle type is all you will pay, and that's a promise! 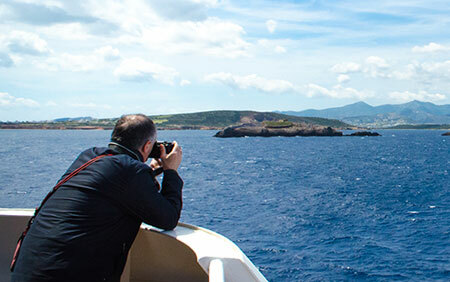 In the unlikely event you find the same all inclusive Bejaia ferry ticket cheaper in the brochure of any other tour operator we promise that we will do our best to beat that price or offer you the choice of requesting a refund. To book Bejaia car and passenger ferry tickets please click here. At ferryto.co.uk you are able to obtain live Bejaia ferry ticket prices, check availability and book car and passenger ferry tickets to and from Bejaia at our lowest available ticket price. Ferryto.co.uk is part of the world's largest online ferry ticket distribution network providing the ability to book over 80 major European ferry operators including to Bejaia and to over 1,200 other ferry routes throughout the UK, France, Spain, Ireland, Holland, Eastern Europe, the Mediterranean, the Baltic and North Africa.